Haq's Musings: Is US Headed Toward Dangerous Regional War? Forty years ago, the United States began to mount raids into Cambodia and to undermine the government of King Sihanouk in order to cut Vietcong supply lines. As a result, America's war with Vietnamese Communism spread into Cambodia, leading to the triumph of the Khmer Rouge and the Cambodian genocide. But these horrors occurred after the U.S. itself had quit Vietnam and after the U.S.-backed regime in South Vietnam had collapsed. Washington's widening of the war benefited neither America nor its local allies. The U.S. is now making the same mistake in Afghanistan and Pakistan. If continued, ground incursions by U.S. troops across the border into Pakistan in search of the Taliban and Al Qaeda risk drastically undermining the Pakistani state, society and army. Many Pakistanis are berating their new civilian government and the military for being too supine in their response to the American actions. There have also been public calls for NATO supply lines through Pakistan to be cut, which could cripple the Western military effort in Afghanistan. The latest dreadful terrorist attack in Islamabad illustrates the danger of a wider conflagration and the price Pakistan is paying for its role as a U.S. ally. The dangers involved in Pakistan are greater even than in Cambodia, where the disasters were contained in one country. The current war has already been driven into the Pakistani heartland. If turmoil increases in Pakistan then the forces of extremism will be strengthened, in the region and the world. Thus the long term implications of "losing" Afghanistan pale into insignificance when set against the risk of "losing" Pakistan. Nor would undermining Pakistan, whether intentionally or not, in any way help the U.S. and NATO mission in Afghanistan. Pakistan has six times Afghanistan's population and is a nuclear state. The Pashtun population of Pakistan is greater than that of Afghanistan, and provides a large number of Pakistani soldiers. Far from saving Afghanistan, present U.S. strategy toward Pakistan will only risk sinking Afghanistan itself in a whirlpool of regional anarchy. Instead of this approach, the U.S. and NATO should adopt a radically new strategy for Afghanistan that relies more on soft power. The approach should be based on the recognition that Afghanistan cannot be transformed along Western lines and that the U.S. cannot maintain an open-ended presence in that country without destabilizing the entire region. Afghanistan must sooner or later be left to the Afghans themselves to run. Local actors should take the lead in carrying out counter-insurgency, as Western forces and an overwhelming reliance on military force are liable only to multiply enemies. The terrible effects of bombardment on the civilian population have become a potent factor behind the will of many Afghans to resist what they see as an alien military occupation. The next U.S. administration therefore should announce a return to America's original objective, that of hunting international terrorist networks and preventing them from creating safe havens in Afghanistan. This should in fact be America's only core objective. The attempt of the West to "transform" Afghanistan is already meeting the same fate as the Soviet attempt to do so. It is strengthening the insurgency, by creating the impression of a threat to the Islamic way of life and local tradition. Instead of continuing with what is in effect a purely Western approach, Washington should initiate serious regional talks on Afghanistan's future. The United States and the West need to remember that however long their forces stay in Afghanistan, sooner or later they will leave, while Afghanistan's neighbors will always remain. Tragically, their policies have in the past generally been directed against each other, with disastrous results for the people of Afghanistan. The United States should instead seek to shape a regional concert that will stand some chance of at least containing Afghanistan's problems in the long term. None of this will be easy; but a continuation of present U.S. strategy promises only widening turmoil in the region, or at best war without end. 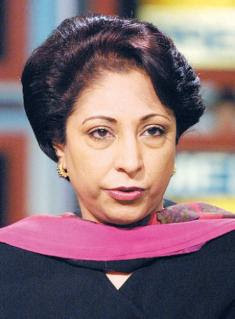 Maleeha Lodhi is a fellow at Harvard and former Pakistani ambassador to Washington and London. Anatol Lieven is a professor at King's College London and a senior fellow of the New America Foundation. US, NATO Fighting to Stalemate? So Pakistan's isn't safe on both borders now! Is it sure that if they leave Afghanistan they'll leave Pakistan too? Because Obama and McCain both aren't ready,they haven't said anything like that.They want to leave Afghanistan but not Pakistan though. I think Ms. Lodhi and her co-author are arguing in this piece that the entire region will be destabilized with very long-term consequences for the world if the US pursues the expansion of conflict into Pakistan. Her example is Khmer Rouge in Cambodia and the "killing fields" that followed US withdrawal from Indochina. A similar scenario could unfold in Pakistan with the radical Muslims (Al-Qaeda and Taliban) taking over a nuclear-armed nation of 160m people and re-enacting the "killing fields" scenario in Pakistan and other parts of the world. It would be far more damaging than what took place in Indochina. Hmmm ... so Ms Lodhi is on the bandwagon that places all culpability for "destabilization" on the clueless Americans. Nice going of washing her hands off this mess - given she was in a position of considerable influence. The Pakistani state has mastered the art of holding a gun to its own head when it is not holding a gun to someone else's. There was Musharraf - supposedly the only bulwark between a rational Pakistan and a nuclear Talibanised state. Now Zardari is the hero who's defending the world against the same scenario. It's a tired charade - a bluff that Obama's likely going to call. Fazlullah and Mehsud are not getting a red button any time soon with the Army and the rich feudals around. To an outside observer, it seems like Pak establishment and US have agreed on a bifurcation of fight against Taliban where by a part of tribal al-qaeda strongholds will be targeted by persistent US air-strikes+few ground ops.In Bajour etc, Pak military will unleash its firepower.The public spat seems just for domestic consumption, otherwise why Pak is so worried about sovereignty when all the while it was not even administering those autonomous areas.US and Pak now needs each others co-operation really badly in short-term with existential threats.A next Taliban regime may not be exactly a Pak puppet, the string pullers of that type of regime will be fully al-qaeda and other rich Arab volunteers.An Iraqi type settlement looks remote given that in Iraqi scenario there was high proportion of nationalist elements in insurgency and al-qaeda component was acting independently and involved in just obscene mass casualty terror. I agree that Pakistani leadership of the past shares responsibility for the current mess we are in, starting from Yahya to Bhutto to Zia and so on. Zia and his cronies( including Sharif), most of all, because they gave us the "gift" of violent "Jihad" to consolidate Zia's rule. But I disagree with you on your assessment of the current situation. If you look at lessons of history, you will see that a narrow band of fanatics have succeeded in acquiring great power and control of nations. It's a mistake to underestimate the potential for incalculable harm from Al Qaueda and Taliban as they gain the sympathies of the population because of perceived foreign occupation and continuing losses of civilian lives, compounded by the growing refugee crisis. Nobody gave Khmer Rouge a chance before the US intervention in Cambodia. But it all changed as long after the US left the region. There are very far reaching, unintended consequences of US and Pak actions today that must not be ignored. The situation on the ground is changing very rapidly and it can easily spiral out of control as the Pakistani state (including civilian and military authorities )get ignored and sidelined by unilateral US actions. it needs the big double CC'S- cooperation and coordination. America needs to adknowledge the sacrifices Pakistan is making on its behalf. that drone attacks are putting unnecessary pressure on an already crippled government. if this is a tactic by the new government and the U.S then its mindless and suicidal. they shouldn't be adding to the long list as to why the Pakistani's mistrust the U.S. especially when its so pivotal to have the Pakistani people support this fight. America needs to remain in Afghanistan while supplying aid and intellegence for the Pakistani Military to use in FATA.the U.S. on the same note should supply real aid to Pakistan. what the U.S. has been giving is the equivalent to a legal bribe. propping up whatever government and not ensuring that the money reaches the Pakistani people or used effectively. but the blame must stop, this division only empowers the very people that are killing innocent Pakistanis. despite the past mistrust the U.S has for Pakistan and vice-versa. the answer is obvious together we stand divided we fall. this statement is especially true to the Pakistani's. now is not the time for bitter infighting, THE COUNTRY IS BURNING.